The aisle for outdoor ceremonies can be quite a bit longer and more difficult to navigate than one that you would encounter in say a church (a large cathedral in a bigger city might be a different story of course!). But here is the good news, everyone will be happy to wait! 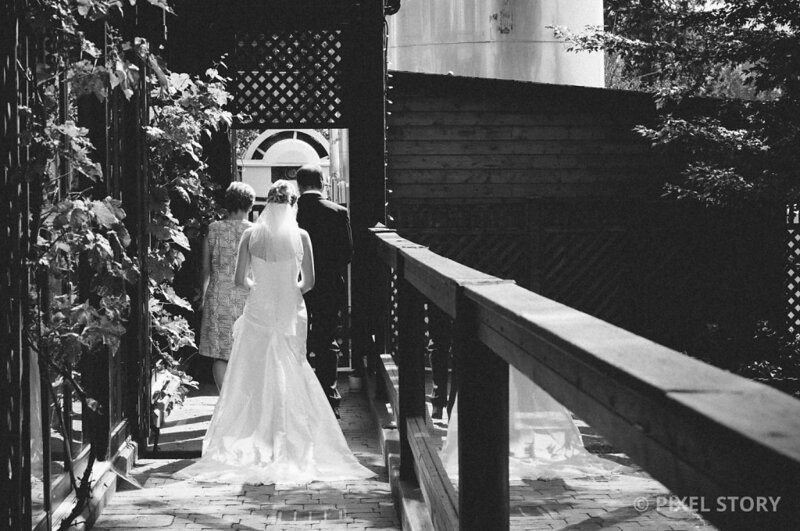 Like in this image of a bride walking down the start of the aisle at Summerhill Pyramid Winery. We can't even see the main ceremony site yet, but on the plus side it heightens the intrigue as the groom and wedding guests only get to capture brief glimpses as the bride makes her way down. After turning the corner there is still a short stone walkway to some stairs and then another stone walkway to the ceremony. The other big plus to longer aisles is it gives us, as the photographers, more time to capture the building emotions of the couple and a bigger variety of images.